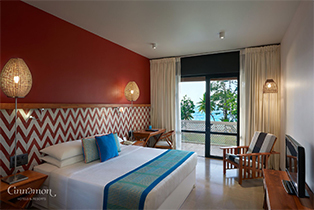 Rooms at Cinnamon Bey Beruwala are a mix of bold colour and playful designs that blend in perfect harmony with the modern architecture of brand new resort. 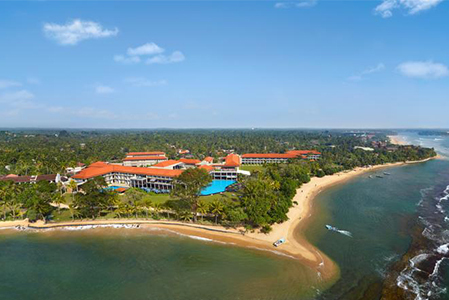 If you’re looking for Bentota Hotels with something out of the ordinary that is both spacious and comfortable then choose from any one of our Superior Rooms, Deluxe Rooms and Suites that are designed to do just that. Each of 200 Ottoman-inspired interiors come complete with great views and a design made to make your holiday complete. Kick off your shoes and settle down on the ultra-cozy beds we give you in Superior Room – you’re here to unwind and we provide just the right means to do so. Over here, comfort melds seamlessly with distinct design to make the 170 Superior Rooms on left wing just about perfect. 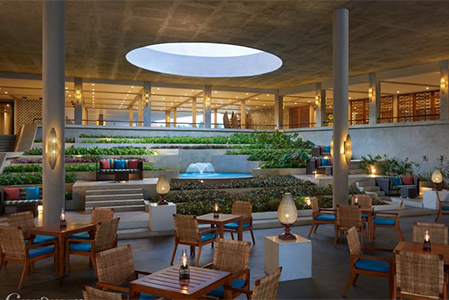 Each comes with its own terrace and a view of the gardens and the ocean beyond. 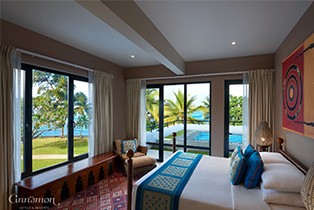 Guests on the lookout for Beach Hotels in Sri Lanka can also enjoy the large screen TV for in-room entertainment, use the writing desk as a convenient worktop and luxuriate in hotel showers. With cool cement floors and vibrant décor, it’s easy to spend more time in your room than you should. 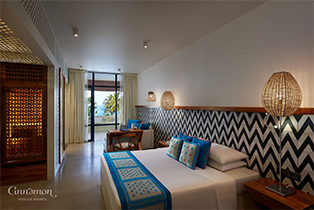 The striking black and white tiles you’ll find in Deluxe Rooms at this beach resort in Sri Lanka are designed for serenity. Each of the 28 Deluxe Rooms are located in an exclusive area of the hotel with a dedicated bar, restaurant and swimming pool. Guests will be opening their doors to a spacious bedroom and sitting room. Look a little further and you’ll find a separate bath and shower area, opening out into a private balcony. Picture yourself in a cinnamon-scented tub, gazing out at the ocean through the wooden windows. Bliss, isn’t it? 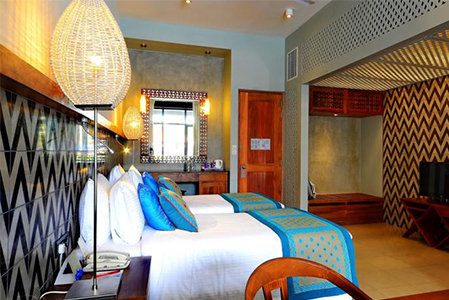 Plush is an understatement when it comes to describing our suites here at Cinnamon Bey Beruwala. Walk in and experience the pleasure of the panoramic view of the entire bay before you. We literally put you on higher ground locating you on the highest point of this resort. These grand suites also include private living and dining rooms in addition to a lush bedroom. Hotel has spared no expense to make you feel pampered and invite you to step into your own private balcony plunge pool for a truly memorable experience. A range of tempting treats await the visitors of our suites, housed in one of the best beach resorts in Sri Lanka.